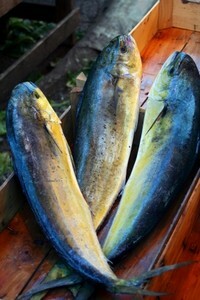 The Mahi Mahi fish is the Hawaiian name for dolphinfish. The Hawaiian nickname of mahi mahi came into use to prevent customers from confusing it with the marine mammal (Dolphin). Most people tend to believe that all mahi mahi fish come only from Hawaii, but they are found in the tropical and sub tropical waters around the world. The brilliant colors of the fish make them one of the most beautiful in the ocean. Caught by longline the mahi mahi can reach up to 50 pounds, but the average weight is 5 pounds. They are usually frozen at sea with the highest quality mahi named "clipper"
Mahi Mahi is a lean fairly firmed meat with a sweet and mild to moderate flavor, very similar to swordfish. The dark portions you may find on a fillet can be trimmed away to produce a much milder flavor. Raw mahi fillets will be pinkish to a grayish white, the cooked meat will be off-white with large, moist flakes. Mahi Mahi is great for grilling and remain moist if you do not overcook it. You can grill the mahi with the skin on or off, I prefer to remove the skin and the darker meat portions first. It adapts well to many seasonings and can even be blackened.